Soup is the easiest thing to make in winter. I know, I’ve already said it, sorry! 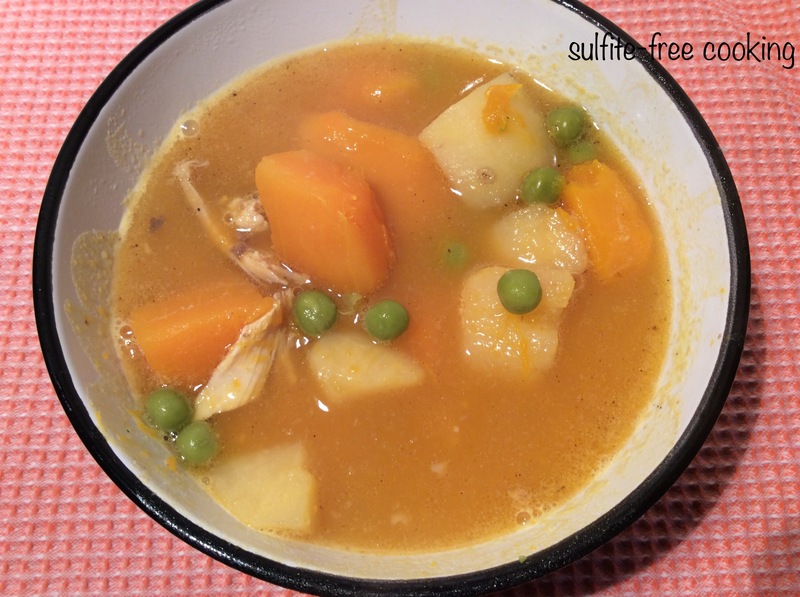 Anyway, this is what I have come to call my “five P soup”: Pumpkin + Parsnip + Potatoes + Peas, cooked in Poultry stock! As with most soups, this one will taste even better reheated. NOTE: the following proportions may be changed as you like; when it comes to soup, one does with what one has readily available! – 150 g parsnip, washed and scrubbed; I used to peel it and even remove its central, harder part, shame on me! I waste no more and now use everything. Wise I have become 😇! – 100 g frozen peas (pretty hard to find fresh locally grown peas this time of year, isn’t it?). No need to peel or cut those up 😄! – (optional) the carcass of a roast chicken, something I systematically freeze after we have eaten roast chicken. You can also use store-bought organic chicken broth, provided you feel safe about its ingredients. 1. Put all the vegetables in a very large pot along with enough water to cover. In the U.S. I always use store-bought mineral spring water, as we found tap water to contain too much chlorine. 2. Homemade broth option: Place chicken carcass on top of vegetables and don’t worry if it is not soaking: unlike the vegetables, it is already cooked. Add about 1 tsp coarse sea salt (celtic salt). Bring to a boil, then reduce heat and cook a good twenty minutes, until the potatoes are tender. Store-bought stock option: Add stock and enough water to cover the vegetables. Salt to taste and proceed as explained above. 3. Remove the carcass, let cool down. Transfer part of the vegetables to a blender and puree. Pluck any small bits of meat that may remain attached to the bone and return to the soup along with the pureed vegetables. Stir, and enjoy!